If you did like to dress up your dreary image with lively stickers on Facebook, you can, from today!. 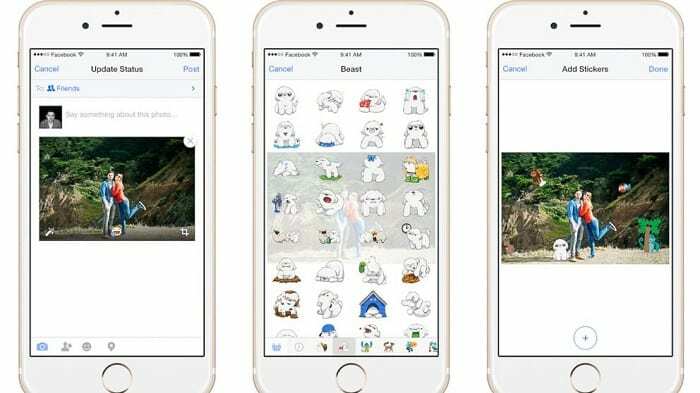 Starting Thursday, you’ll be able to add stickers to your photos from Facebook’s mobile app on iOS and Android smartphones. In the updated App, when you are uploading a image, you will see a new sticker icon that will bring up a menu of graphics you can choose to add to a photo to Facebook image. All you have to do is select the sticker you want to add, drag it to the image, change the size, rotate it and preview it before you decide to upload the photo to Facebook. You can do unlimited changes to the image prior to uploading it through the mobile App. The update is available for Facebook’s iOS and Android apps. So dress up your images with puppies, dolls and dinosaurs.